Today is the first day of the Jewish month of Elul, which means only one thing. 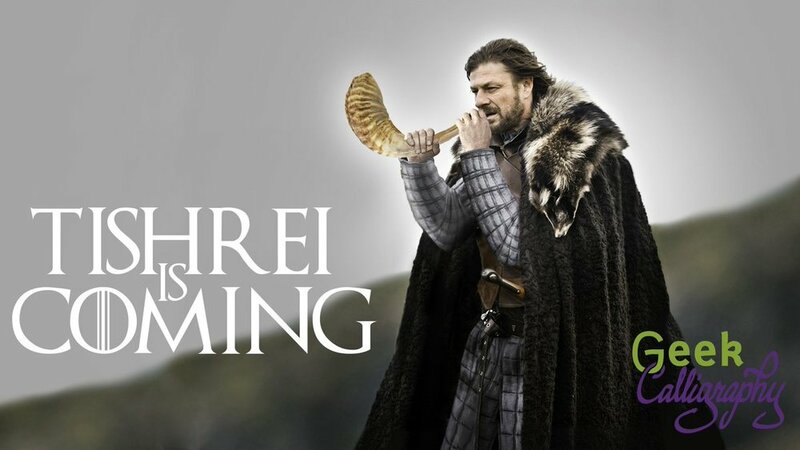 Image shows Ned Stark blowing a shofar, with the words "Tishrei is Coming." For those of you who aren't Jewish, or aren't observant, you may be wondering what all the yelling is about. Rosh HaShanah, or Jewish New Year* is on the first of the month of Tishrei. It kicks off an entire month of festivities. Rosh HaShanah runs two full days in the lunar calendar (meaning it starts in the evening and ends two evenings later). It involves going to very, very long prayer services and eating a festive meal each dinner and lunch, usually shared with other people. Think four Thanksgiving meals in two days. So that's the first two days of the month. On the 10th day of the month is Yom Kippur. That's a day of fasting and atonement. There's no eating or drinking during the day itself, but that means lots of hydrating leading up to it, and we are supposed to eat a large, festive meal before the fast starts. On the 15th day of the month starts the holiday of Sukkot, or the Feast of Tabernacles. If you have Jewish neighbors and see them putting up an oddly flimsy looking hut-like thing in their yard with a bunch of dead plants on the top of it, that's a sukkah, a booth or a tabernacle. Said booth is not supposed to be built before Yom Kippur, but it must be completely finished by the time Sukkot starts. We spend the next 7 days eating in these booths, starting with two more days of holiday (or one, if you live in Israel or are Reform, about which more below**), during which we spend more time praying and eat another four Thanksgiving-dinners-worth of meals. Yes, in the hut, we eat all that food in the hut. There are lots of bugs, and sometimes raccoons, skunks, and coyotes. On the 22nd day of the month is Sh'mini Atzeret, the Eighth Day of Assembly. It's another festival day, with more long prayers. Eating in the tabernacle is optional on this day, but there are still two festive meals to be eaten. On the 23rd day of the month is Simchat Torah (in Israel and on the Reform calendar, this is combined with Sh'mini Atzeret), the Celebration of the Torah. This is when we celebrate completing the annual reading of the Pentateuch and begin the lection cycle anew. It is a relatively new holiday, but there's still lots of praying and eating, though not outside anymore. All of this is in addition to regular Sabbath observance, which involves more festive meals and praying. Also, those of us who are observant of the Jewish prohibitions against work on the holidays have to take a whole mess of days off from our jobs, but deadlines don't get pushed back. In sum, in the space of a month we need to prepare and host or be hosted for about 13 Thanksgiving dinners, spend 7 full days in synagogue, still observe the Sabbath, and meet all of our regular work deadlines. Hence the screaming. All of this goes double if you actually work in a synagogue and have to orchestrate this at a professional level as well as for yourself as an individual. New year for animal tithes, happens in the summer (today, in fact, first of Elul). **Why is the holiday calendar different in Israel than for Jews outside of Israel, except for Reform Jews? Before you ask, yes, they had astronomy and almanacs back then, everyone could have worked it out for themselves when the holidays would occur, regardless of location. That wasn't the point. The point was that the new month did not begin until the Sanhedrin declared it so. Most Jews who live in the modern State of Israel no longer consider themselves obligated to follow the requirement of the additional day of holiday observance. (Whether that is because they are in the historical location of the Land of Israel or they consider the modern State to be a new manifestation of the historical Land is a point of serious debate. Let's not go there now.) Likewise, the Reform Movement has declared that, in light of the calendar now being fixed as opposed to each holiday being individually declared, they see no need to retain the second day observance. The Conservative and Orthodox Movements outside of Israel retain the additional day. Except Rosh HaShanah is still observed for two days within the State of Israel and by most Reform congregations. Why? I don't know.